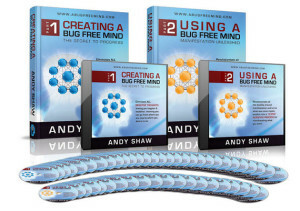 Welcome to our review of Andy Shaw’s Bug Free Mind Private Members group (called a Bug Free World). An overview of the Bug Free Mind process. Creating a Bug Free Mind (book and audio review). Using a Bug Free Mind (book and audio review). Success Made Simple (on-line video course review). The links to each of those articles can be found at the bottom of this page. What is the Bug Free Mind private members group? This is a private ‘high achievers’ community which has been set up for those people wanting to take their lives to ‘the next level’; or who have just had enough with ‘making do’. Why would I want to join a private members group? The personal development world is a strange beast. You either get it or you don’t. Those that don’t ‘get it’ do not understand why people are seemingly wasting their time reading about stuff that we should all ‘automatically’ know. Those that do understand personal development often have a hard time trying to explain to their family and friends why they are pursuing a lifetime of personal growth. To be able to grow as quickly as we would like, it is crucial that we surround ourselves with like-minded, positive, high-achieving, and forward thinking individuals. We don’t want those who are going to sow the seeds of doubt in our mind; or put us down for attempting to achieve success. Not only do the individuals in a Bug Free World help each other, but the community spirit also makes the learning experience to be a lot more enjoyable. Isn’t this just another forum or Facebook group though? There are loads of them. Why is this any different? They can get hit by external spammers trying to push their own products. People get into unnecessary arguments. The forums / groups quickly fall by the wayside – with no one participating. The bug free mind private members group is quite different. In this group, which is run by Andy and a couple of very dedicated and knowledgeable moderators, people only talk about topics about positive personal development. The focus is laser-sharp. There is never anybody spamming the group and everyone is very supportive of each other. The bug free mind members area is split into several sections. The actual platform looks similar to Facebook in that you have a Newsfeed ‘wall’ as the main feature of the page. On that wall you can see other members postings. The notifications you get can be about other members individual blog postings, or when they post to a forum thread. Anyone can start a forum thread – on whatever topic they wish. People can then ‘Like’ the comments or make follow-up comments accordingly. Just like Facebook, you can make friends with other members. Once you’ve done that you can then send personal messages to each other. And when you log-in to the members area, you’ll see a number of notifications. By clicking on this you can see all of things that have happened since you last logged in. Remember all of the people in this group have one thing in common……. A massive appetite to move their own lives forward and, in the process, help as many other people move their lives forward as well. You can make some really great ‘connections’ in this group (we have). Certainly, if you’re a business owner, this group is a must have. Whilst we are encouraged to share thoughts within the group, you can make your private area invisible to other members. These are ‘your space’ pages, where you can upload motivational videos and pictures. With the videos, you can actually upload them directly from YouTube. You also have space where you can type blog entries. There is another section titled ‘my private journal’ which is only accessible to you. 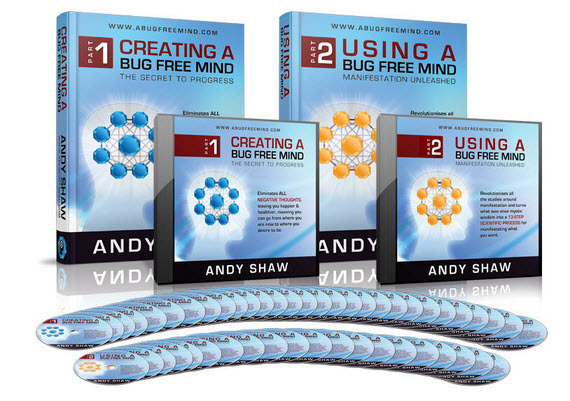 ‘Ask Andy’ is a page where you can submit questions to Andy Shaw, the author of the Bug Free Mind process. The answers are stored in a dedicated part of ‘your space’. This is a brilliant private tool (also known as the wheel of life), which allows you to score certain elements of your life (between 1-7). 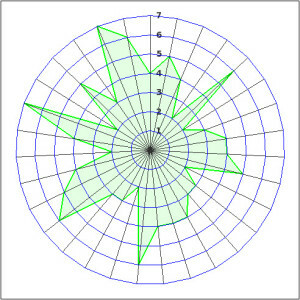 The idea is that you try and make the circle as ’rounded’ as possible. Whenever you complete the circle of life it is saved. Therefore you can go back at a later date and re-calculate it to see how much you have improved. Here is an example of a completed circle of life on the right-hand side of this page (you DON’T want your life looking like this). part of your members area. There is a fantastic archive of articles, relating to the Bug Free Mind process. These original articles are accessible from the members area and many of them were ultimately used for the book publications. There are 10 free videos available in which Andy Shaw speaks directly to camera. These are up to 30 minutes each and provide interesting insight into Shaw’s thought process regarding a bug free mind. Those who have purchased the audios and the Success Made Simple videos can access them from the private member’s dashboard. You need to sign up (see links below). There are 3 levels of membership. You can sign up for just a month, to really see the benefits of this group, or you can take one of the other packages (annual of lifetime membership), which work out MUCH CHEAPER. A Bug Free World – Learn more HERE. A Bug Free World – Membership Options HERE. If you do decide to sign up to Andy Shaw’s Bug Free World, we shall no doubt see you in the members area. We’d also like to offer you a welcome gift of 66 free personal development books. You can read about them here. We really do think that there is a great deal to be had by joining the Bug Free Mind Private Members Group. It is well worth joining (we have lifetime membership) and there is great support from everyone. However, to really benefit from the group, you might want to look at one of Andy’s main products – see review links below. Here we summarize the Bug Free Mind programs if you are unsure what package to go for. A full review of the 28 chapter book which will finally clear ‘baggage’ from your past and stop you fretting about the future. A full review of the 20 chapter book. Having cleared the bugs from your mind, it’s time to move on to ‘guaranteed’ success. A video version of the 2 books. All 400 videos will (eventually) be reviewed here. We are reviewing them as we get them.